Killian isn't who she thought he was. Now she is sitting in a jail cell for something she didn't do because of him. But maybe she deserves to sit in jail anyway to pay for her past mistakes. All she knows is she needs to stay far away from Killian no matter how much her heart aches for him. Kinsley Felton has been arrested for things she knows nothing about. And she doesn't believe that her father and grandfather are guilty of these charges either. After spending a night in jail, she is released and never wants to spend another night there. She has to prove the FBI wrong about her family. When Killian or whoever he is tries to tell her to take the deal the FBI is offering, she can't because she doesn't know anything and will not testify against her grandfather. With Killian trying to keep away from Kinsley and save his job, it is hard because he is realizing that his feelings for her are stronger than he wants to believe. But Kinsley hates him for trying to take down her family and for all the lies he has told. Can she move past all Killian's lies and still love him? Will she believe the truth when she learns just what her father and grandfather were up to? Will she spend the next ten years in jail for something she knew nothing about? And what is in the letter from her father? To me, Kinsley was more together in this book then she was in the first book, she was a spoiled little rich girl and maybe spending another night in jail and realizing what was really going on around her has toughened her up some. I am enjoying this story and can't wait to read the next book. After reading the first book in this series, I had very mixed feelings. There were so many missing pieces and so much confusion. I was happy to get my hands on this book to finally get some answers. It definitely had them, but I still think the first two books would have been better for the reader if combined. Kinsley may think her world is falling apart, but she has no idea how bad it actually is. When it is all revealed, she needs to find herself and figure out what to do. Killian knows his and Kinsley's relationship and his relationship with the FBI are both on rocky ground. He's teetering on a fine line trying to juggle both and keep Kinsley safe. Can he do that if she doesn't trust him? Overall, I liked this book much better than the first and will be looking into the next one for more answers. 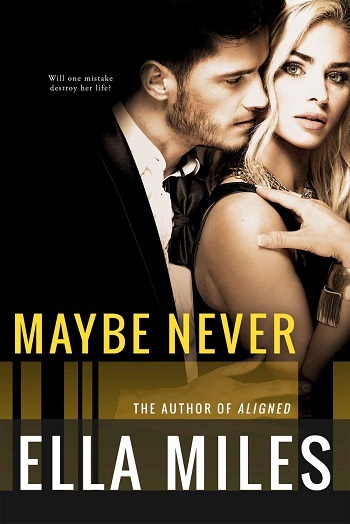 Reviewers on the Wicked Reads Review Team were provided a free copy of Maybe Never (Maybe #2) by Ella Miles to read and review.